Estonia is an independent state created after the breakup of the Soviet Union. The nucleus of the Estonian Jewish community was founded by Jewish soldiers after their demobilization from the army of Czar Nicholas I in the mid-19th century. Today, approximately 1,700 Jews live in Estonia. There is little information regarding the arrival of Jews in Estonia. There are, according to archive materials, individual reports of Jews in Estonia as early as the fourteenth century. This, however, should not be considered the starting point for a permanent Jewish settlement in the region. In fact, Jews were prohibited from living in Estonia. The process of Jewish settlement in Estonia began in the nineteenth century, when an 1865 statute by Tsar Alexander II granted them the right to enter the region. This allowed the so-called ‘Nicholas soldiers’ and their descendants, kantonists, First Guild tradesmen, artisans and Jews to settle in Estonia and other parts of the empire. The Nicholas soldiers and artisans founded the first Jewish congregations in Estonia. The Tallinn congregation, the largest in Estonia, was founded in 1830. The Tartu congregation was established in 1866 when the first fifty families settled there. A Jewish congregation does not exist without its synagogue; the largest of which was constructed in Tallinn in 1883 and in Tartu in 1901. Both of these were subsequently destroyed by fire in World War II. As time passed, the Jewish population spread to other Estonian cities where houses of prayer and cemeteries were erected at Valga, Pärnu and Viljandi. At that time, the Jews sought to establish their own network of education. Yeshivot were established for the teaching of the Talmud, and elementary schools were organized in Tallinn in the 1880s. The majority of the Jewish population at that time consisted of small tradesmen and artisans, very few were literate and Jewish cultural life lagged. A change was brought about at the end of the nineteenth century when Jews entered the University of Tartu. University students did much to enliven Jewish culture and education. 1917 saw the founding of the Jewish Drama Club in Tartu. Approximately 200 Jews fought in combat for the creation of the Republic of Estonia, and 70 of these men were volunteers. The creation of the Republic of Estonia in 1918 marked the beginning of a new era for the Jews. From the very first days of her existence as a state, Estonia showed her tolerance towards all the peoples inhabiting her territories. The government sought ways to overcome national hostilities and discrimination. This set the stage for energetic growth in the political and cultural activities of Jewish society. Between May 11–16, 1919, the first Estonian Congress of Jewish congregations was convened to discuss the new circumstances Jewish life was confronting. This is where the ideas of cultural autonomy and a Jewish Gymnasium (secondary school) in Tallinn were born. Jewish societies and associations began to grow in numbers. The largest of these new societies was the H. N. Bjalik Literature and Drama Society in Tallinn founded in 1918. Societies and clubs were established in Viljandi, Narva, and elsewhere. In 1920, the Maccabi Sports Society was founded and became well-known for its endeavors to encourage sports among Jews. Jews also took an active part in sporting events in Estonia and abroad. Sara Teitelbaum was a 17-time champion in Estonian athletics and established no less than 28 records. In the 1930s there were about 100 Jews studying at the University of Tartu. In 1934, a chair was established in the School of Philosophy for the study of Judaica. There were five Jewish student societies in Tartu Academic Society, the Women’s Student Society Hazfiro, the Corporation Limuvia, the Society Hasmonea and the Endowment for Jewish Students. All of these had their own libraries and played important roles in Jewish culture and social life. Political organizations such as Hasomer Hazair and Beitar were also established. Many Jewish youth traveled to Palestine to establish the Jewish State. The renowned kibbutzim of Kfar Blum and Ein Gev were set up in part by Jews from Estonia. In 1919, a Jewish elementary school was founded by the Tallinn congregation. Its first class graduated in 1923. At the request of the parents, the first gymnasium class started in the autumn of 1923 and the second class followed in 1924. In its first year, 223 pupils studied there. In 1924, a new schoolhouse was constructed at the expense of the small Jewish community and what they could not pay for themselves they borrowed. The Gymnasium played a very important roll in Jewish cultural life in Tallinn and all of Estonia until 1940. The Maccabi Sports Society operated there, lectures were read, get-togethers were organized, soirees, balls, theatrics, and song and dance showed the many facets society offered. Samuel Gurin served as director from 1925 when the gymnasium was officially established until its liquidation by the Soviet authorities in 1940. On 12 February 1925, the dream was fulfilled. The Estonian government passed a law pertaining to the cultural autonomy of minority peoples. This was a logical step forward in the national policies of the Estonian Republic. The Jewish community quickly prepared its application for cultural autonomy. Statistics on Jewish citizens were compiled. They totaled 3,045, fulfilling the minimum requirement of 3000 for cultural autonomy. In June 1926 the Jewish Cultural Council was elected and Jewish cultural autonomy was declared. The administrative organ of this autonomy was the Board of Jewish Culture, headed by Hirsch Aisenstadt until it was disbanded in 1940. When the German troops occupied Estonia in 1941, Aisenstadt evacuated to Russia. He returned to Estonia when the Germans had left, but was arrested by the Soviet authorities in 1949. The cultural autonomy of minority peoples is an exceptional phenomenon in European cultural history. Jewish cultural autonomy was of great interest to global Jewish community. The Jewish National Endowment presented the Estonian government with a certificate of gratitude for this achievement. In 1936, the tenth anniversary of Jewish cultural autonomy was celebrated. The Board of Jewish Culture worked actively. Boards of trustees were established in many of the larger cities. Three schools operated: the gymnasium in Tallinn, a secondary school in Tartu and an elementary school in Valga. In the 1930s, 352 pupils were enrolled in Jewish schools, i.e., 55% of the school-age population. In cities with few Jewish children language and history lessons were organized by the local cultural boards of trustees. There were Jewish kindergartens established in Tallinn, Tartu, Narva, Viljandi and Pärnu. In 1934, there were 4,381 Jews living in Estonia (0.4 percent of the population) and 2,203 Jews lived in Tallinn. Other cities of residence included Tartu (920), Valga (262), Pärnu (248), Narva (188) and Viljandi (121). A total of 1,688 Jews contributed to the national economy: 31% in commerce, 24% in services, 14.5% were artisans, and 14% were laborers. There was also large business: the leather factory Uzvanski and Sons in Tartu, the Ginovkeris’ Candy Factory in Tallinn, furriers Ratner and Hoff and forest improvement companies such as Seins and Judeiniks. There was a society for tradesmen and industrialists. Tallinn and Tartu boasted Jewish cooperative banks. Only 9.5% of the Jewish population worked freelance. Most of these were physicians, over 80 in all. In addition, there were 16 pharmacists and 4 veterinarians. 11% of the Jewish population had received higher education, 37% secondary education and 33% elementary education. 18% had only received home education. This small Jewish community established its own social welfare system. The Jewish Goodwill Society of the Tallinn Congregation made it their business to oversee and execute the ambitions of this system. The Jewish Assistance Union was active in Tartu, and welfare units were set up in Narva, Valga and Pärnu. The peaceful and active life of the small Jewish community in Estonia came to an abrupt halt in 1940 with the Soviet occupation of Estonia. Cultural autonomy in addition to all of its institutions was liquidated in July 1940. In July and August of the same year all organizations, associations, societies and corporations were closed. A large group of Jews (about 400) were deported on 14 June 1941. After the German occupation later in 1941, all Jews who had failed to flee were murdered. According to data from Israel, 1,000 Estonian Jews were executed in 1941. After the war, a number of Jews who had previously fled to the Soviet Union returned to Soviet-occupied Estonia. There was, however, no rebirth of Jewish cultural life. Communist Party policies were hostile to Jews and were implemented as part of an Anti-Zionism campaign. Hence, in addition to physical destruction, the Jews in Estonia met moral and cultural catastrophe. Only the congregation as a religious unit was operative. One of its duties was to take care of the Rahumäe Cemetery. No synagogue was erected and services were conducted in a house of prayer which was in poor repair. Jews were not allowed to learn their own language and history, nor to practice their traditions. Some people found guilty of learning Hebrew were sentenced to time in prison camps. There were establishments and offices where Jews were not allowed to work. The Soviet authorities used two categories: citizenship (Soviet) and nationality (Jew, Estonian, Russian etc.) which were stated in the person’s passport. Some people even tried to change their nationality. Thus the Soviet Union extinguished the historical memory of the Jewish community: the young were no longer aware of their own ethnic background. Parents and grandparents were afraid of telling children of their heritage. Moral genocide of approx. 2.5 million Jews was implemented in the Soviet Union. People were not allowed to investigate the Jewish genocide which happened during the German occupation. The archives were off limits to Jewish researchers. In addition, Jews had difficulty gaining admittance to institutions of higher education, especially in Moscow, Leningrad and Kiev. For this reason, young people striving to quench their thirst for knowledge attended the University of Tartu and the Polytechnical Institute in Tallinn (now known as the Technical University). Young Jews arrived in Estonia from Moscow, Leningrad and elsewhere. If they were unable to find jobs in their home towns, they did not have that problem in Estonia. Many of the new arrivals became professors and department heads at the University of Tartu. Some even achieved world renown such as Jury Lotman, a professor in semiotics. In the 1970s Jews also started coming to Estonia on their way to Israel or the United States. Estonia, for good reason, became known as a place from which it was easy to leave the Soviet Union. From 1940 until 1988 the Estonian Jewish community, as elsewhere in the Soviet Union, had no organizations, associations nor even clubs. In March 1988, the Jewish Cultural Society was established in Tallinn. It was the first of its kind in the entire Soviet Empire. There was a lack of experience in organizing the workings of a national cultural society and, of course, no rooms were available. But the enthusiasm generated enough momentum to accomplish many things despite failing resources. The Society began by organizing concerts and lectures. Jewish people, deprived of the possibility of any cultural activities for fifty years, joined in. Soon the question of founding a Jewish school surfaced. 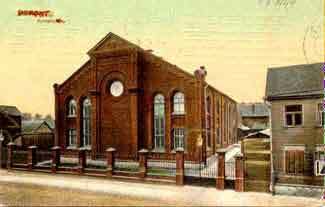 As a start, a Sunday school was established in 1989. The Tallinn Jewish Gymnasium on Karu Street was being used by a vocational school. An agreement was reached with the director which allowed the Sunday School to use the school rooms. In 1990, a Jewish School was established. Jewish culture clubs, which remained under the wing of the Cultural Society, were started in Tartu, Narva and Kohtla-Järve. Other organizations followed; the sports society Maccabi, the Society for the Gurini Goodwill Endowment and the Jewish Veterans Union. Life returned to the Jewish congregation. Courses in Hebrew were re-established. Thanks to the Jewish communities of Israel and other countries a relatively large library was opened. The gamut of cultural activities kept on growing. The Jewish Cultural Society is a founding member of Eestimaa Rahvuste Ühendus (Union of Estonian Peoples) which was founded at the end of 1988. The restoration of Estonian independence in 1991 brought about numerous political, economic and social changes. The Jews living in Estonia could now defend their rights as a national minority. The Jewish Community was established in 1992, and its charter was approved on April 11, 1992. The Jewish Community in Estonia acts as an umbrella organization for the above-mentioned organizations and societies if they so desire. As members they also retain their autonomous structures. Presently the community consists of about 1,000 Jews. Most recently, a Jewish synagogue was re-opened in Tallinn. The membership is dominated by pensioners (over 50%) and this presents some obstacles. The community is headed by the council, elected by the whole membership. The council’s activities are co-ordinated by the chair and two assistants who are chosen from the ranks of the council. The elaboration of an education system, the organization of culturally oriented activities, and the promotion of historical research. The allocation of social welfare for families elderly, invalids, accident victims etc. The allocation of aid to Aliya (the repatriation of Jews to Israel). The representation of Jewish rights in governmental bodies. A part of Jewish tradition is loyalty and support to the people and state where they live. Likewise, Estonia has traditionally regarded its Jews with friendship and accommodation. To illustrate this, a new Cultural Autonomy Act, based on the 1925 law, was passed in October 1993. This law grants minority peoples, such as Jews, a legal guarantee to preserve their national identities. In July 2005, Estonia unveiled a memorial stone in the former concentration camp in Klooga. Altogether 22 memorials honoring the Jews killed in Estonia during World War II are slated to be erected. Some 1,500 Estonian Jews died during the war, and an estimated 10,000 Jews were killed in Estonia after having been deported to camps there from elsewhere in Eastern Europe. Recently the Chabad Lubavitch Orthodox Jewish movement appointed the country's first Rabbi since the early 1940s, Chief Rabbi Shmuel Kot. On May 2007 the community celebrated the opening of its first synagogue since the country's Jewish community was destroyed in the Holocaust. The new synagogue, which can fit 180 people in the main worship area, was built at a cost of about $2 million with money from the US-based Rohr family foundation and Estonian Jews and non-Jews. Estonian Foreign Minister Sven Misker slammed the BDS movement in a May 2017 interview, stating that the way to go [forward] is [through] negotiations rather than making efforts to intimidate the other party. Misker went on to clarify that Estonia highly values it's relationship with Israel, viewing it as a friend and partner. The Estonian Jewish community celebrated the 10-year anniversary of the re-founding of their community after the Holocaust, in May 2017. Prominent Jewish politicians from around the world, including Israel’s chief Ashkenazi rabbi David Lau, were welcomed by Estonian President Kersti Kaljulaid at a ceremony in the country's capital.